Diamond Orthopedic’s proprietary bone screw technology is revolutionizing orthopedic fixation. [A] Based on studies conducted at Orthokinetic Testing Technologies; tested in biological and non-biological test substrates. Data on file. 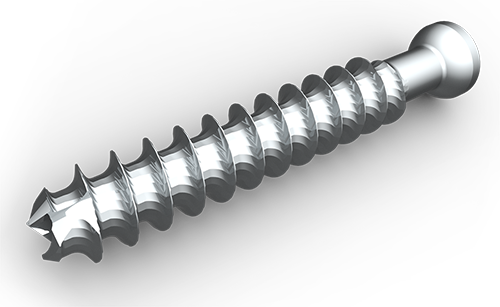 [B] Based on in vivo ovine testing conducted at OrthoKinetic Testing Technologies as compared to market leading helical screw with same profile. Additional validation testing has been performed in non-biological substrates. Data on file. Since the first screw was invented by Archimedes for irrigation purposes around 200 B.C., over 1,000 years would pass before the screw was used for its more familiar purpose: a helical threaded fastener. Likewise, the basic 'helical' design of today's orthopedic fastener has remained relatively consistent since the 1940's. Diamond Orthopedic's faceted threadform is the new fixation standard in orthopedics. Since the first screw was invented by Archimedes for irrigation purposes around 200 B.C., over 1000 years would pass before the screw was used for its more familiar purpose: a helical threaded fastener. Likewise, the basic 'helical' design of today's orthopedic fastener has remained consistent since the 1940's, save for minor revisions. We are seeking distributors in the United States for our innovative product portfolio.